The Imploding Portraits Inevitable series draws inspiration from Andy Warhol‘s film work of the 1960ies. Fragments of random conversations, dialogues or commercials, visual elements such as extreme close-ups reminiscent of Warhol‘s famous screentests, as well as the use of the split-screen, bring alive reflections of (possible) protagonists of the historic Factory. The stage-set created especially for these performances allows visual reflection to succumb to our current reality. 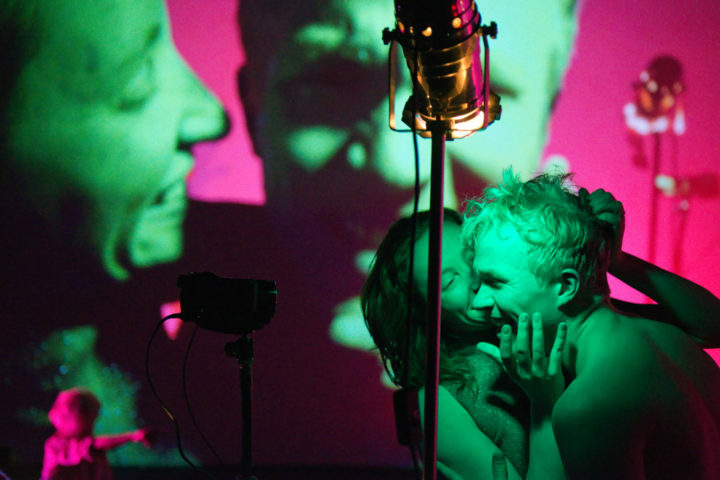 Using handheld cameras, the performers create the projected images and rhythm of the performance live on stage. In all the performances, the cameras and spotlights are manipulated by the performers live on stage, creating a live image on screen. In Liquid Loft's Imploding Portraits Inevitable series of performances, today's media-guided self-optimization is confronted with its innermost historical avatar. Warhol's Exploding Plastic Inevitables have turned into an imploding anti-spectale.